MULTAN: Heavy rains and flash floods lashed several districts in Punjab on Saturday, ravaging villages and road and rail networks. 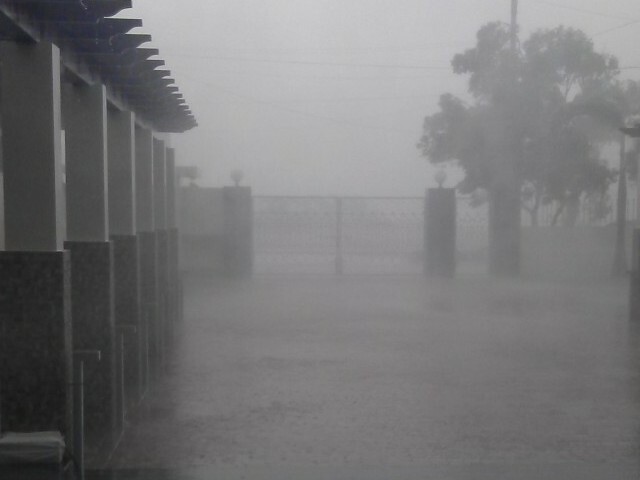 At least five people died in rain related incidents, as hill torrents swept across Dera Ghazi Khan, Rajanpur and Jampur districts in southern Punjab. Floods have affected an estimated 100,000 people on Punjab-Balochistan border, district officials told The Express Tribune. At least ten tourists were also reported missing in the tribal belt of Rajanpur, they said. Crops were devastated as around 200,000 acres of farmland was inundated. Road links between towns and villages in southern Punjab, meanwhile, were severed by heavy rainfall continued throughout the day. Despite the downpour, however, residents in many areas were forced on to rooftops as flood water accumulated below. Flood water also entered Fareed Air Base in Rajanpur, as the Kachi canal, which supplies water to Balochistan from the Taunsa Barrage, breached due to heavy rainfall. Dera Ghazi Khan division Commissioner Chaudhry Muhammad Amin gave eviction orders for flood hit areas and around 800 people have been shifted to safer places. At least 35 flood relief camps have been set up, EDO health Rajanpur told reporters. In northern Punjab, Sialkot district’s Pasrur tehsil suffered heavily as the Nullah Daik – a seasonal stream that originates in Indian-administered Kashmir, swelled up due to flood torrents flowing down from hills. The early-morning deluge devastated 30 villages and disrupted road and rail links connected to the district. A wave of floodwater swept over railway lines and roads linking Pasrur and Narowal. Federal Minister for Science and Technology Zahid Hamid, MPA Rana Mohammad Afzal and senior district administration officials of the area visited the flood-hit localities, where people urged public representatives to declare Pasrur a calamity hit area. Afzal issued directives to remove encroachments and repair a bridge on Nullah Daik. The worst hit area of Pusror is said to be Qila Ahmedabad where houses are inundated by water four feet deep. Published in The Express Tribune, August 4th, 2013.